'A Better Start' – How will it pay? In our first Preventonomics blog we commented that there is a general agreement in both policy and research spheres that we should ‘invest’ more in prevention and early intervention services. By increasing the amount of money spent, outcomes for children will improve and so there will be a ‘pay-off’ in terms of reduced use of expensive services in later years, and potential for societal saving though better attainment at school and at work. However, it is important to know how much you are spending today to generate those downstream savings, particularly in these times of budgetary constraint. 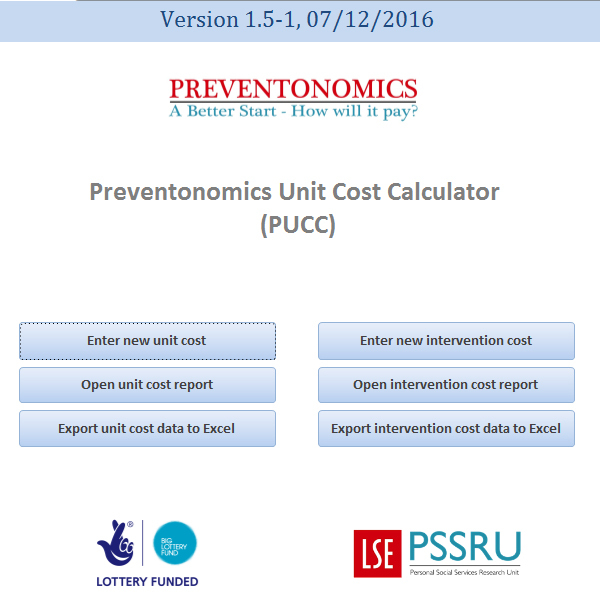 In this blog post, we introduce the Preventonomics Unit Cost Calculator – or PUCC. This simple, free-to-download Access database can help you estimate costs. The PUCC was originally developed to support the A Better Start initiative, funded by the Big Lottery Fund, to understand the costs of the interventions the five participating sites are putting in place. The PUCC can help users, researchers and providers alike, to estimate the costs of their new – and existing –health and social care services. Of course, a blog is not the place to provide detailed user instructions but full Guidance, with screenshots to illustrate the PUCC, is included in the PUCC download. The PUCC can help you to estimate the cost of a single professional, but the exciting feature (exciting for us anyway!) is that you can build up the cost for a more complex intervention. Perhaps where two professionals deliver two-hour weekly sessions to a group of families over a ten-week period; or where nurses, social workers and occupational therapists deliver an integrated package of treatment and care for someone who has just left hospital. Or PUCC can be used to estimate the impact on the cost of a course of cognitive behaviour therapy should different professionals deliver it. This screenshot of the PUCC welcome page shows the PUCCs facilities. Each large button takes the user to a different PUCC function. Clicking Enter new unit cost allows you to estimate details for single professionals. The data entry form asks a series of questions about the profession type and grade, salary, and the organisations’ overheads, as well as hours worked. The underlying method builds on the approach used in the Unit Costs of Health and Social Care volumes to help ensure the unit costs are calculated in a robust and systematic manner. The programme has some default values already entered, however, we advise using your own local data so that the resulting unit costs better reflect your local circumstances. The unit cost can be viewed by clicking the button labelled Open unit cost report. Importantly, the information entered here is stored in your database so you don’t have to enter this information again. Key to the PUCC is its capacity to generate more complex costs. Enter new intervention cost allows you enter information about how your intervention or service will be developed and delivered: staffing requirements, number of sessions or users, etc. You can draw in information on the cost of the professionals involved from the database. Again, all this information is summarised for you and can be viewed by clicking the Open Intervention cost report button, and is stored in the database. The buttons labelled Export unit cost data to Excel and Export intervention cost data to Excel do just what it says on the tin – or rather, the button. They enable you to easily export your data into a spreadsheet format. This is especially useful for intervention cost data, which can be further analysed using pivot tables and graphs. It would be great to find a connection between our PUCC and Shakespeare’s Puck, thus coming up with an amusing end to this blog post. Perhaps there is a tentative link between “… yonder shines Aurora’s harbinger…” and “bringing in a new dawn of unit cost calculations”? To be honest, even to us this seems over the top, not to say convoluted. However, we believe that PUCC is a useful addition to the existing toolkit for developing and understanding unit costs data; we hope that users will agree. provide an early estimate of the cost savings that could be made from their prevention interventions five and 35 years down the line. Our thanks are extended to the Big Lottery Fund (BLF) who commissioned this work as part of their A Better Start initiative and we would like to thank the A Better Start team at BLF for their support. We would also like to thank the A Better Start site personnel who contributed their expertise and PSSRU colleagues who helped us with this work, particularly Lesley Curtis, Cate Henderson and Valentina Iemmi who ‘road-tested’ earlier versions, and the members of the PSSRU cost-effectiveness cluster who provided feedback and advice.